You know the following situation: your phone rings, you pick it up, but you have to jot down something, continue working on your computer or you just like to gesture a lot while talking over the phone (which is completely normal, by the way). However, phones always keep one of your hands busy, hindering you from doing your job. And if you do want to use both of your hands, you have to put the caller on speaker, which is rude and may disturb your colleagues. This is why headsets come in handy. 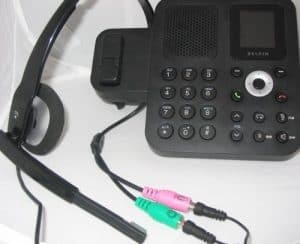 Using a headset with your VoIP phone system and any hardware you may want to use for it involves a bit more than just plugging in your headphone jack, an issue you can do away with altogether by opting for a wireless headset rather over wired headphones. Let’s take a look at the options and why one solution may be more favorable than the other, and which of the best VoIP headsets we recommend. Regardless of what kind of headset you are using, there is one major advantage over simple handsets: they are more comfortable to use, because your hands are completely free. Furthermore, you don’t have to put the caller on speaker, adding more to client discretion, while you also completely filter out any disturbing external noises thanks to stereo voices. Regular headsets all have 3.5mm audio jacks, meaning that any device (telephone, computer, smartphone etc.) having such a jack can host a headset without installing any software. Moreover, audio signals can be divided thanks to audio jack splitters/combo jacks. However, if your headset has a different jack, like USB or Lightning, you are in trouble: those headsets cannot be used with desk phones having audio jacks. Some headsets don’t have volume controllers, which forces you to use that of the phone (if it has any) or the computer. And if you don’t want to be “bound” by the headset cord and go wireless, we have some bad news: these can be a bit unreliable due to signal losses and other possible interferences. Like we said before, using a headset can be very tricky if it cannot be connected directly to the device. Thankfully, companies always have neat little solutions with which the above problem can be easily eliminated: adapters, or in other words, headset buddies. These adapters exist in all forms: they can convert headsets with one audio and one microphone jack to a single plug and vice versa (which is ideal for smartphones with a single jack input) or solve the issue between a 3.5mm and a 2.5mm jack. There are also headset buddies, which help to build a “bridge” between the newest Apple standard Lightning jacks (from iPhone 7 and up) and a regular 2.5mm/3.5mm. Furthermore, adapters can solve one of the biggest compatibility issues: they provide relief for desk phones that do not possess “normal” audio jacks, but the RJ9, RJ10 or RJ/22 standard. Like we said before, wireless headsets are less reliable, despite giving you almost complete freedom and total comfort of use. The biggest problem with them (aside from their prices) is that Bluetooth connection is only good within a certain range: the moment you go too far, the connection is dropped. Furthermore, unless your PC/Mac/smartphone has Bluetooth preinstalled, you need an adapter. And if you want to connect desk phones with a wireless headset, you need a docking station with the right jack. The beauty of using a headset is that any device can be used – provided that it has the right jack or you have an adapter. The cherry on top is that you can buy headsets anywhere, including VoIP providers too. However, keep in mind that we are talking about a very wide-spread accessory, therefore don’t expect many VoIP companies to have headsets in stock. In fact, you have to apply the method we suggest to our readers when choosing the right cloud phone system provider: look up multiple products, hear the opinion of others, select the best ones, go through their pros and cons and pick a winner. After that, check whether the selected headset is available from your VoIP provider’s store: if not, or if it’s overpriced (headphones are usually pricier at VoIP providers), look it up in sites like Amazon, eBay, online electronics stores etc. Now that we talked about the background of headsets, it is time to introduce you to some of the best picks of the market. In order to represent the versatility of headsets, we decided to show you wireless device, a foldable version and a traditional headset. 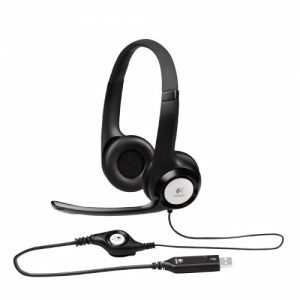 One of the best-known audio products of Switzerland-based company, the Logitech H390 (also known as ClearChat Comfort) is perfect for those who want to enjoy the reliability of standard headphones with the comfort of a USB jack. This 0.32-ounce light headset has extremely comfortable, adjustable padded headband alongside plush ear pads, which, sadly, can easily wear and tear over time. The microphone, which can be rotated in a 90 degree angle, is equipped with noise cancelling, while the USB jack provides crystal clear sounds and voices. Speaking of the jack, it works the same way as regular jack: just plug the device into a PC or Mac and you are ready to use. However, this means that the device cannot be used on devices without a USB port. Logitech sells this product for $39.99, but at sites like Amazon, you can get it for $24.99, including shipping. This featherweight headset has a behind the neck, foldable and a tad fragile design which is not only ideal for comfort, but for easy portability as well. 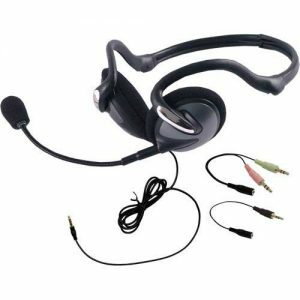 The GE 95432 features a detachable, in-line microphone with which you can give voice commands to adjust the volume, mute or answer a call (since the headset doesn’t have a volume controller). 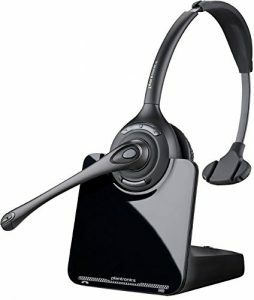 The headset is equipped with a single 3.5mm audio jack, but it comes with two headset buddies: one computer adapter and one 2.5mm phone adapter. Out of all three headsets, this one is available for the best prices: it can be purchased for as low as $14.99. With $359.95 ($167.95 at Amazon), Plantronics’ wireless headset is the most expensive of our picks, but it is the most advanced at the same time. Despite having a monaural, over-the-head design, the Plantronics CS510 features crystal clear sounds and voices with one-touch volume and mute buttons are built into the headphone, and can provide a 350-feet range for over 9 hours. The docking station, to which you can connect up to 3 additional headsets, ensures that all external noises (whether inbound or outbound) are cancelled, and can connect to your desk phone without an adapter.